We’ve discussed several topics related to the full cycle Recruitment Processes dealt with resolving challenges that most Talent Acquisition professionals face on a regular basis. We’ve even covered the trending hiring techniques that are practiced and so much more. But have you come across a scenario where you constantly make interview calls that are rendered unanswered by Candidates after conducting multiple follow ups? Would you like to find out how you can tackle this situation? If yes then you’re in the right place. But there are other alternatives have terms that if they withdraw the offer there will be a financial penalty but they may turn out to be counterproductive. But bear in mind that there could be genuine cases where you need to take their responses in to consideration before reacting using drastic measures. Realise that no one is so busy to not at least drop a message; in such a scenario it is preferable not to consider them for the role instead of worrying whether they will join. Even though we’re changing their lives know that you will come across Candidates who don’t value that but that too is perfectly alright. Know that you will have candidates who keep you informed that they are exploring other options as well which is perfectly fair, as we too pursue other candidates simultaneously. Receiving cold responses or even no response affects the relationship with the Recruiter and their impression in the job market. In the initial stage try to understand and get to know more about the candidates else there is no point in processing it to the next level. Avoid candidates who swap jobs quickly and take a written commitment for everything at the time of acceptance of the offer. You can implement ways and means e.g. like sue them in the court of law if you receive an acceptance from them for the same but they in turn play up and don’t join the Company within the specified time frame. If you’re prospective candidate already has an offer in hand but are stalling for better opportunities to compare. Responding back with a Yes, No or Speak later is basic business etiquette which you should know. If you come across a candidate who evades calls and suddenly picks up from another number then i.e. a big red flag that needs your consideration. Learn to face uncomfortable situations in an honest and forthcoming manner in order to be able to manage complex problems once the candidate joins your organisation. You need not follow up to a very large extent whereas for others follow ups and selling the position is required on the role and at the organisation. If you come across such candidates know that they are not active jobseekers; although they may clear the technical test / interview but chances are they will not join. In such a scenario it is preferable not to spend your time or the panel’s time on such carefree candidates. Look at things from a Candidate’s perspective to understand their behaviour and possible reasons for it for e.g. think about it, if you had out of 2 or 3 offers at your disposal you’d compare the offers to find out which is the best one to pick? And it’s a given, you’ll always go with the best opportunity. As far as possible look at the Candidates perspective before reacting as sometimes there are Candidates who have a genuine reason for their behaviour. This brings the enlightening conversation to an end with a lot of insights to take back with us. One of the most important ones we avoid as Recruiters is looking at things from our perspective. Sometimes things are best explained when we take the Candidates perspective in to consideration. Without considering another’s perspective we get affected fast which wouldn’t be the case if we focussed on these aspects as well; as it helps us understand things better. With clarity in thought you are able to react in an appropriate manner which makes a big difference in the long term. And one of our representatives will get back to you. So if you’d like to gain more insights into the trends or recruitment practices that are followed in the Recruitment Industry for instance, How to identify if a Candidate Joins or simply uses the Offer? Then it’s absolutely essential that you join these groups. WhatsApp. 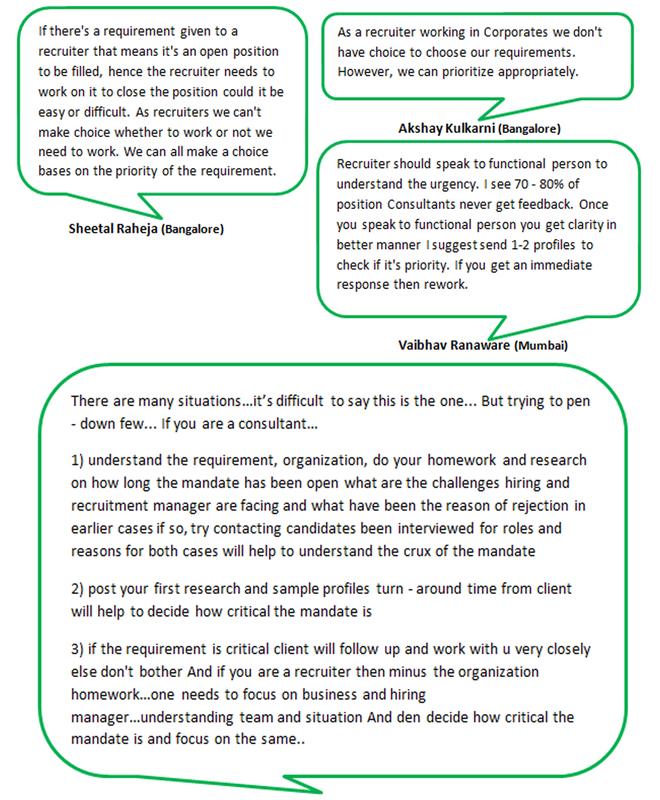 Group Chat – How should a Recruiter decide whether to take a Requirement to source or not? A Talent Acquisitionist needs to remain updated with the current trends followed in the Recruitment Sphere. With Social Channels being utilised to capture Talent and the flow of information on them keeping tabs on the upcoming trends can be overwhelming. One of the ways to stay updated is to be part of Recruiting groups where there are activities that give you real time updates. Discuss with seniors and if the need can be full filled internally by giving extra training to the existing staff. Post your first research and sample profiles turn – around time from client both these aspects will help to decide how critical the mandate is. If the requirement is critical the client will follow up and work with you very closely else don’t bother. If you are a Recruiter then minus the organization homework one needs to focus on business and hiring manager. If you’re facing difficulty then gain further clarity by interacting with the concerned individuals is absolutely necessary. Well there you have it all the important information you’ll require to make your decision and guidelines to assist you in achieving your KRAs. If you’ve read so far than we’re sure you found what you’re looking for and you also realise what you’re missing out on. So let’s avoid being passive learners and strive to be active ones instead. There has been a lot of talk about Candidate experience and joining goodies including employee & employer branding. We have also emphasised the impact of a Candidates positive or negative interview experience can have on the company branding as well. But do you realise how crucial the element is in Recruitment? If you haven’t yet thought about it then here’s a chance for you to find out how crucial the element is thanks to the suggestion of our Mumbai Group Member Dinesh. So the discussion was on, “Candidate delight / experience, a crucial element in Recruitment” And we’ll be disclosing the conversation shortly but right after that we’ll be highlighting the key take a way pointers so be sure to go through them. This brings an informative discussion to an end with lots of inputs to take back and add to your learning about aspects that you might not have discussed before. With the amount of information that is shared it sometimes becomes overwhelming, hence; here are the key take a ways to help you retain what you’ve learnt. Candidate Experience is quite essential especially in the interview stage as they can either create positive or negative Company branding. Candidate delight is an important influencer to becoming an employer of choice as there are few takers to join a hostile company. Pay close attention to family occasions like a child’s birthday when giving a DOJ can increase the chances of retaining a new hire that will generally remain with you for at least a couple years and are usually grateful and happy with the hiring Company due to the consideration. When a Candidate is interviewed, a good experience will definitely be a positive factor, a motivator & vice versa. If the Candidate does not join there is a possibility of the applicant showing interest in future projects and even provide references when asked. Most importantly such individuals will avoid spreading negative views about your brand or Company within their circle which can create damaging publicity. In case you are hiring a Recruiter / TA and the Candidate was rejected or does not join; a positive experience can help get a job with their company or their referrals in the future. 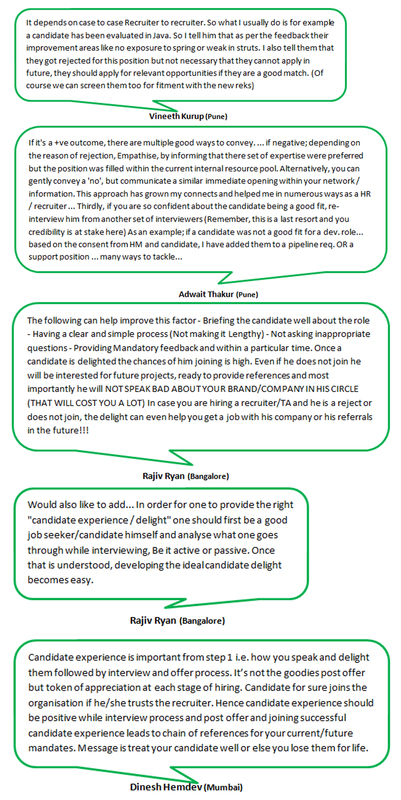 To provide the right “candidate experience / delight” one should first be a good job seeker / candidate them self and analyse what one goes through while interviewing whether active or passive. 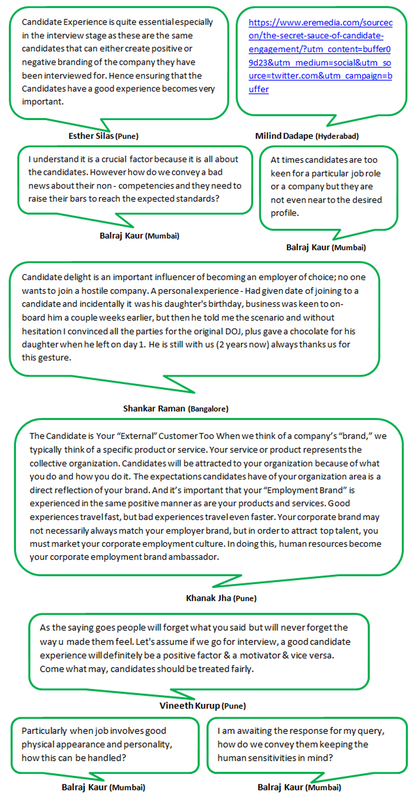 Once you get a clear understanding of the Candidates perspective, developing the ideal candidate delight becomes easy. Candidate experience is important right from the initial point of contact i.e. how you speak and delight them which are followed by the interview and offer process. It’s not the “goodies post offer” but the “token of appreciation” at each stage of hiring. Candidates are sure to join the organisation if they trust the Recruiter, hence candidate experience should be positive right through the interview process, post offer and joining. A successful Candidate experience leads to a chain of references for your current / future mandates hence treat your candidate well or else you close doors to better Candidates and opportunities. When giving the above mentioned news you need to keep in mind that it depends on case to case and Recruiter to Recruiter basis. You can inform Candidates that they were rejected for this position but that doesn’t necessarily mean they cannot apply in future. It is important to let them know that they should apply for the relevant opportunities if they are a good match besides we can screen them to see if they are a perfect fit for the opportunity. If negative; depending on the reason of rejection empathise is to be given to the set of expertise that were preferred but the position was filled within the current internal resource pool. Alternatively, you can gently convey a ‘no’, but communicate a similar immediate opening within your network / information. Using these approaches you can grow your connections which can help in numerous ways as a HR / Recruiter. If you are confident about the candidate being a good fit, re-interview him from another set of interviewers but as a last resort as your credibility is at stake here; for e.g. 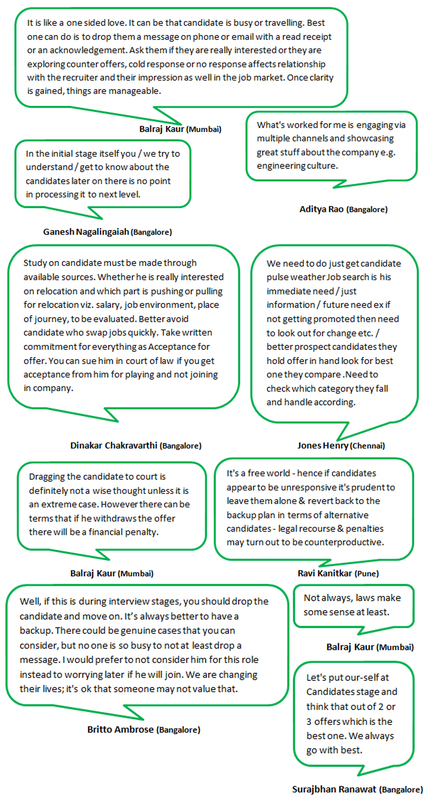 if a candidate was not a good fit for a Dev. Role based on the consent from the HM and Candidate you can add them to a Pipeline Request or a support position; if you have such a process in place else try and implement it. When we think of a brand we typically think of a specific product or service which in turn represents the collective organization. It’s important that your “Employment Brand” is experienced in the same positive manner as are your products and services. Your corporate brand may not necessarily always match your employer brand, but in order to attract top talent, you must market your corporate employment culture. When these aspects are considered and implemented, human resources becomes your corporate employment brand ambassador. 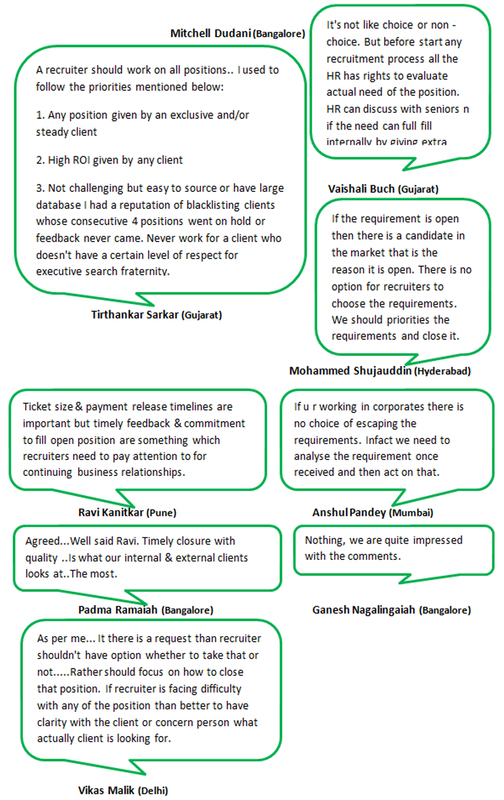 Candidates need to realise that they need to raise their bars to reach the expected standards if they don’t meet the requirement; instead of insisting on getting selected for the desire profile at the company of choice. Leave your views in our comments section along with your request’s to join these WhatsApp groups for more inputs related to How to identify if a Candidate Joins or simply uses the Offer? Simply DM us @SourcingAdda with your contact No. and location and one of our representatives will get back to you. 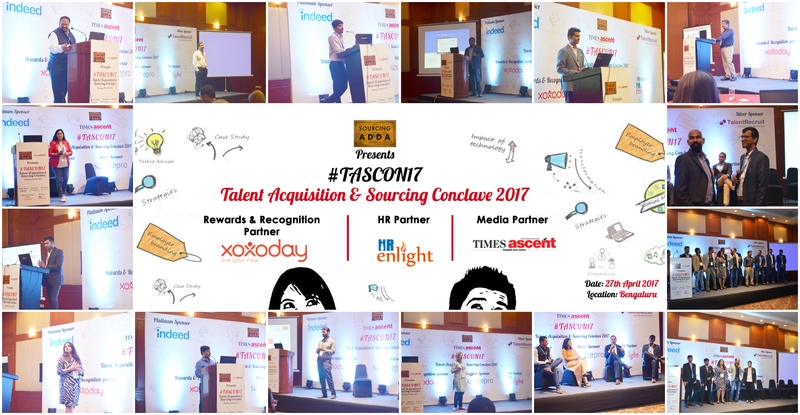 The Talent Acquisition & Sourcing Conclave (#TASCON17) was held this time at Bengaluru, in Hotel Chancery Pavillion which helped Sourcing ADDA achieve another milestone. The event consisted of 18 renowned speakers from reputed companies with 250 attendees ranging from Directors, Heads, Managers, Executives, Sourcing, Recruiting and H. R. professionals within the Recruitment sphere. We @SourcingAdda would like to take this opportunity to thank our Sponsors i.e. Timesascent as Media Partners, Indeed as a Platinum Sponsor, Talent Recruit & SourcePRO as the Silver Sponsors while the Rewards & Recognition Partner i.e. XOXOday and the HR Partner i.e. HR Enlight for their support and assistance. The combined efforts and support of the Speakers, Delegates, Sourcing ADDA Team and the volunteers from Indus Business Academy, Bangalore (formerly known as Indian Business Academy) that altogether made the Talent Acquisition & Sourcing Conclave (#TASCON17) achieve its grand success. We had several activities where we divided the sessions in to sections namely, Strategy Hub and Sourcing Lab. Several of the Sponsors joined in by conducting activities themselves. We even had some general activities for all the attendees and speakers to enjoy at #TASCON17 which were the ‘Best #Twitterati Contest’ (most tweets), ‘#SelfieContest’ (best selfie) and an open ‘#SourcingContest’ (to utilise Sourcing skills acquired and improve your Talent Acquisition skills by competing with the best within the industry) to complement the event. The sessions that were conducted in the two sections were related to the names of the sections. The Strategy Hub being more of a theoretical one while the Sourcing Lab was a practical one. The Sessions in the Sourcing Lab included live demonstrations of tips, tricks and hacks to capture the Talent Magnets. Here techniques and skills were showcased for fellow Talent Acquisitionist’s to acquire and build on; in an attempt to be better Talent Magnet Sourcing professionals. Apart from this we also had three networking breaks for the Speakers, Attendees and Sponsors to interact with each other and form connections. After a brief introduction about the host i.e. Sourcing ADDA and the purpose for conducting the #TASCON17 event were delivered by Yusuf Pathan (Managing Director at Key Resourcing & SourcePRO & Founder of Sourcing ADDA) the sessions commence beginning with the Keynote session. The section as mentioned above was more of a theoretically based one where trending Recruitment practices were addressed. The second last session was conducted by Yusuf Pathan (Managing Director at Key Resourcing & SourcePRO & Founder of Sourcing ADDA) which was a, “Round Table Discussion”. As the name suggests this particular section was more of a practical one where live demonstrations of tips and tricks or hacks to capture the Talent Magnets were covered. Having, said that here techniques and skills were showcased for fellow Talent Acquisitionist’s to acquire and build on. The first session was conducted by Akberali Engineer (Social Media / Internet / Passive Sourcing / Training Specialist from Capgemini) on, “Stalk the right way” which comprised of live demonstrations of tips & tricks for Sourcing Talent Magnets. The next session was 2 sessions of 30 minutes each conducted by Nikhil Patil (Senior Specialist Talent Acquisition from Netcracker Technology Solutions) and Snehal Gaikwad (Recruitment Specialist from Tieto on, “Sourcing Google…ly”. The Talent Acquisition & Sourcing Conclave (TASCON17) concluded with the prize distribution ceremony and a thank you Speech also delivered by Yusuf Pathan (Managing Director at Key Resourcing & SourcePRO & Founder of Sourcing ADDA). To get a coup d’oeil of #TASCON17, Bengaluru you can catch the Storify here – https://goo.gl/qSo0jB And if you wish to get a sense of what we’ve accomplished or achieved so far you’ll have to find out for yourself by visiting Talent Acquisition and Sourcing Conclave (#TASCON17). If you’re looking for an opportunity to gain practical exposure and experience it then, be sure to join us for another remarkable and enlightening experience at Talent Acquisition & Sourcing Conclave (#TASCON17) soon to be held in Pune as well. And on an even grander scale with twice the fun scheduled and win exciting prizes. To experience it first – hand and catch all the action live while you enjoy while adding to your knowledge and blossom into better Talent Acquisitionist’s it is important that you attend the #TASCON17 Pune event.